In the 1992 movie Scent of a Woman, Al Pacino, playing a blind, cranky aesthete, walks across a college campus in autumn. He and his companion cross paths with a woman and talk politics for a moment. Al Pacino’s nostrils quiver. “Fleurs de Rocaille,” he says (in a terrible accent). Nice party trick, Al. As an auburn-haired woman of about the same height, I wouldn’t automatically pair Caron Fleurs de Rocaille with tall-ish redheads. I see it complementing sweet-faced teens who adore the Little House on the Prairie series.1 Of the Bennet sisters in Pride and Prejudice, Jane would choose Fleurs de Rocaille. Auburn-haired political junkies in the early nineties, susceptible to gents like Pacino, might have gone for Must de Cartier. Ernest Daltroff created Fleurs de Rocaille in 1933. 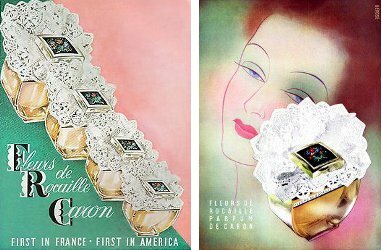 (Note: Be sure not to confuse Fleurs de Rocaille with another Caron fragrance, Fleur de Rocaille — singular “Fleur” — a 1993 floral as strident as “Fleurs” is gentle.) Its notes include lily of the valley, clover, rose, violet, lilac, jasmine, iris, sandalwood, musk and civet. My review is based on a vintage Eau de Toilette at least 30 years old and a circa 2005 Eau de Toilette. Of the fragrance’s notes, clover is the one that speaks most loudly to me. Fleurs de Rocaille has the tender feel of a pasture on a spring afternoon when the sun has dried the grass, and a breeze picks up sweet clover and budding trees and a faraway patch of cutting garden. And carnation. Its hint of spiciness keeps Fleurs de Rocaille from being too limp. In short, Fleurs de Rocaille is sweet, safe, and gentle — and not a bit in fashion. A quick wash of aldehydes at first and a gentle landing of sandalwood, musk and moss that is more fluff than scent peg it as “old-timey.” Fleurs de Rocaille sweetens, just like a clover stem, as it wears. It’s quiet — especially the older version — and doesn’t last long on my skin. The newer version of Fleurs de Rocaille is soapier and sharper than the soft vintage fragrance. I prefer the sleepier, more pastoral vintage take. If I'm ever invited to a May baptism in the English countryside, I know just what perfume I'll wear. Caron Fleurs de Rocailles Eau de Toilette is $85 for 50 ml. For information on where to buy it, see Caron under Perfume Houses. 1. I know, in what fantasy land do I live where teens wear Caron and not the latest release from Victoria’s Secret? You’ve made me crave Fleur de Rocaille! I enjoyed Scent of a Woman and I think Pacino was brilliant in it, I still think his best performance (and I haven’t seen of all of his work) is his role as Michael Corleone. He should have had an Oscar for that role, it was sheer, menacing brilliance. He’s a naturally menacing looking guy, I think! A mystery is why Caron keeps Fleurs and Fleur on the market at the same time. Must cause endless confusion. It definitely causes confusion! When I was looking up Fleurs in the Nigel Groom perfume book, the bottle pictured was “Fleur” and the notes might have been, too, although the description was definitely for the 1930s perfume. Fun review, Angela! Hannibal Lecter pulled that trick a year earlier, and I think L’Air du Temps was a bad match for the Jodi Foster character. How do they choose these things, anyway? I smelled Fleur (not “Fleurs”) de Rocaille a couple of years ago while I was sniffing through the Carons at Clyde’s Pharmacy (RIP). The somewhat pushy SA was insistent that this was the best seller. I don’t really remember the scent, which maybe says something, though my taste has changed, and I wouldn’t mind revisiting it now. That’s right! I completely forgot about Clarice Starling and L’Air du Temps. She had an innocence about her, and I can imagine her wearing L’Air du Temps as a girl, but by the end of the movie, at least, she deserved a perfume with real backbone. Thanks for this review Angela! it’s a shame it doesn’t sound more intriguing, I love the name and the bottle. Scent of a woman it’s just a total cornball movie to me – but now I’m going to look up the other perfume references. And yes – I’d love to have heard the discussion in the writers room when they were picking which perfumes Al would identify. I did just read your review of Chamade, which sounds very promising, but I’ve never smelt it. I’m going to visit Paris for the first time this April. I imagine myself marching into the flagship Guerlain on the Champs Elysee buying Chamade and wearing it my whole trip. Oh, you’ve got to smell Chamade! If you like hyacinth and green notes and a whiff of tart black current, you’ll love it. Have fun in Paris! thanks Angela! I can’t wait to smell it, I do like hyacinth & green – not sure what black current smells like but I am hopeful! But wait! The cartoon lady in the print ad does kind of look like the actress in Scent of a Woman who wears Fleurs de Rocaille, does she not? I saw that, too! I’m still not convinced, though. The carnation helps edge it toward auburn, but not enough for me. This one gave me a headache, but that was a different time in my life and I must revisit! Now I’m craving Parfum Sacré! I have a bottle somewhere. Must find it. I was reading a biography of Frank Sinatra, and there is a section about his affair with Ava Gardner. I think they were meeting at a friend’s house, and the friend relates that sometimes Frank and Ava would have a fight, and she would kick him out of the upstairs area where they met. But after a while, the scent of her Fleurs de Rocaille would float down the stairs, and Frank would know he could return. Either the friend has his perfumes mixed up, or Fleurs de Rocaille must have been a less pastoral scent in those days! Wow! I’d have guessed that Ava would have worn something saucier. There’s something alluring about the innocent perfume and not-so-innocent movie star, though.